Studentvikarie is a platform established in 2015 in Göteborg, Sweden developed for the purposes of delivering temporary job vacancies for students willing to practice their teaching skills. The service allows students looking for a part-time job in education to browse through advertisements or create one of their own giving them the opportunity to decide how much of their time they are willing to work. With years of observations, Studentvikarie proved that competent people educate students with a passion and lust for knowledge. 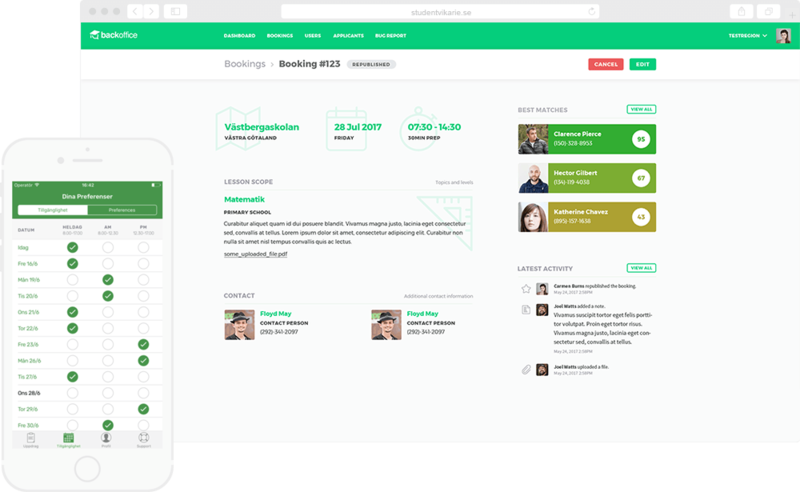 The CTO wanted to find a partner to develop a progreessive web application (PWA) and build a platform that will help Swedish schools to grow by delivering the extraordinary and most qualified teachers. The company was looking for near shore developers who will handle the process from start to finish as well as handle the design side of the process. The solution should bring opportunities for students to gain experience and test their teaching skills. Studentvikarie contacted Selleo when they were looking for a trusted partner who could help them achieve their goals and develop a PWA that would meet their needs. We created a team of five developers who worked on the project from the very start to finish. While working on the project we provided full-stack development, including data modeling and service API development as well as supported the Swedish team. The web-based platform is supported by its own mobile application. It is used to manage the job-seeking process and filter through available positions that best match provided requirements. The application includes location-sensitive filters for Stockholm, Gothenburg, and Skåne expanding slowly to other regions. Users can get notifications when there is an assignment that matches their profile, check schools profiles and decide on their working engagements. In 2017 Studentivkarie was appointed to be the Social Entrepreneur of the Year by one of the Swedish newspaper. Thanks to the hard work put into the development, we were able to deliver a product supporting schools as well as students in finding employment. I've found an exceptional development partner in Selleo. Thanks to their skill, adaptiveness and integrity, I consider them dear and full members of my team for both backend, web, and React Native development.